Discard Color Profile discards the image's currently assigned ICC profile, and instead assigns GIMP's built-in sRGB profile. 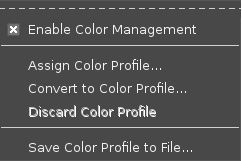 You can access this command from the image menu bar through Image → Color Management → Discard Color Profile. The image's appearance will change (unless the image is already in an ICC profile color space that has the same colorants and channel encoding as the newly-assigned GIMP sRGB color space). The image's channel values are not changed by discarding the currently assigned profile and instead assigning GIMP's built-in sRGB profile. Discarding the image's currently assigned profile is useful if you wish to export an image to disk without an embedded ICC profile. Discard Color Profile can only be used if the ICC color profile assigned to the image is not a GIMP built-in sRGB profile. GIMP's built-in sRGB profiles are not embedded in images that are exported to disk.